The warlords of Japan…have surrendered unconditionally…Our global victory… has come with the help of God…Let us…dedicate ourselves to follow in His ways. Help me to be, to think, to act what is right, because it is right; make me truthful, honest, and honorable in all things; make me intellectually honest for the sake of right and honor without thought of reward to me. Give me the ability to be charitable, forgiving, and patient with my fellowman – help me to understand their motives and their shortcomings – even as Thou understandeth mine! 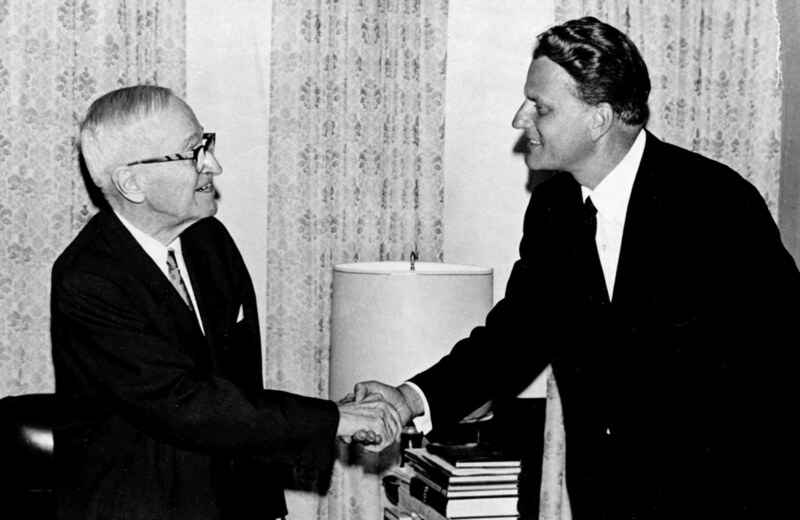 Billy Graham had exploded on the national scene as a result of his Los Angeles Crusade. At the young age of 32, he was America’s Evangelical darling. With a distinguished southern accent, he was passionate but tempered, evangelical and gracious. It was in 1950, that he first visited the Oval Office. Truman was twice his age, yet Graham forwardly put his arm around President and asked if they could pray together. Truman fell to his knees and Graham prayed. When he walked out of the White House, reporters were eager to know what had transpired and the uninitiated and naïve Graham was too innocent and eager to tell them – even posing on his knees for photographers. Truman issued orders that he was never to return to the White House. Billy Graham offered deep regrets and reflected that it was a hard way to learn such a valuable lesson about confidentialities with Presidents and world leaders. Other Presidents would be more forgiving. Graham would meet with them all during the course of his life. Deciding to end the war with Japan in such a costly way did not come easily to President Truman. On September 2, 1945, aboard the USS Missouri, MacArthur accepted the surrender of the Japanese. The casualties were staggering – 59 million had died. The US counted 292,000 dead and 631,611 wounded. The fundamental basis of this nation’s law was given to Moses on the Mount. The fundamental basis of our Bill of Rights comes from the teaching we get from Exodus and St. Matthew, from Isaiah and St. Paul. I don’t think we emphasize that enough these days. If we don’t have the proper fundamental moral background, we will finally end up with a totalitarian government which does not believe in the right for anybody except the state. 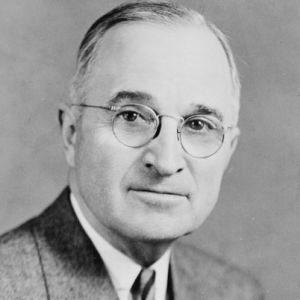 Public Papers of the Presidents of the United States: Harry S. Truman, Vol. 1, April 12 – December 31, 1945 (Washington, DC; Government Printing Office, 1946), 3. William Hillman, Ed. Mr. President: Personal Diaries, Private Letters, Papers and Revealing Interviews of Harry S. Truman (London: Hutchinson, 1952), 17.